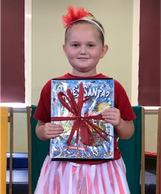 Well done Caitlin Parker who won the Michael McCormack Christmas in the Riverina colouring competition. Out of 1100 entries Caitlin's was chosen to be used on Mr McCormack's Christmas Card for 2019. These cards are sent to all Mr McCormack's contacts including the Prime Minister. What a fantastic effort!! 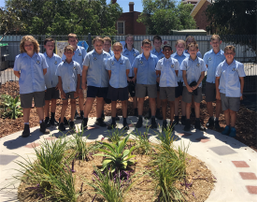 Thank you to Mrs Daniher, Mrs Mangelsdorf and Mrs Haworth for the preparation of the Year 6 Farewell Mass this week. 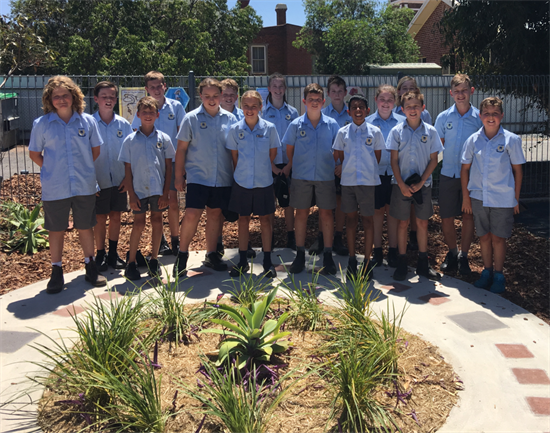 Year 6 are pictured at the our new Rosary Garden which was blessed by Father Emil earlier this week. Christmas is the time of love, peace, hope and goodwill. So why do we push and shove in lines at the the shopping centre? Why are we impatient in the parking lot or when when online? Christmas is the time to share a meal and conversation with those we love. Wouldn't it be wonderul if we also thought of the friendless and the lonely? Christmas is the time for turkey, prawns, pavalova, drinks and parties. Yet do we share our abundance with those people in our communities who do not have enough to eat? Open your hearts first, not your bags. Think of others first, not of yourselves. 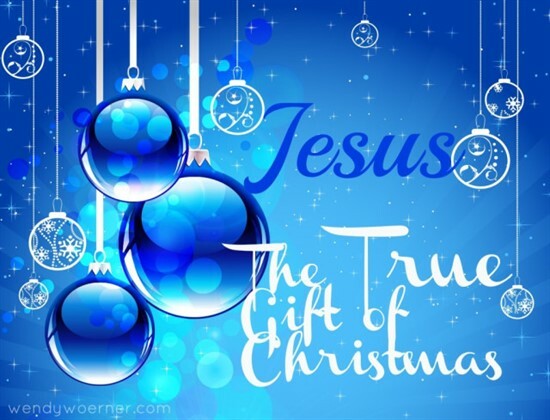 For Christmas is the birthday of Jesus. We are taking nominations now for our swimming carnvial on Friday 1 February. Kinder and Year 1 students we will see you on the night for novelty games - there is no need to fill in the nomination form. 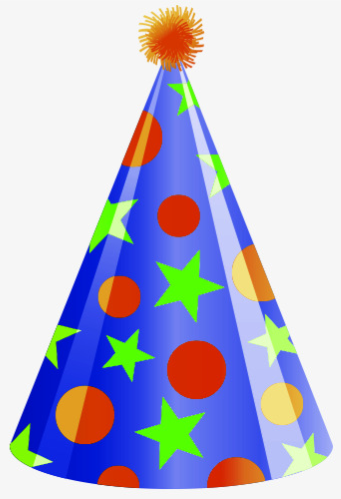 Year 2 students who are still 7 in 2019 can only swim 25 metre races, if they do not want to swim 25m races they do not need to nominate, we will see you on the night for novelty games. 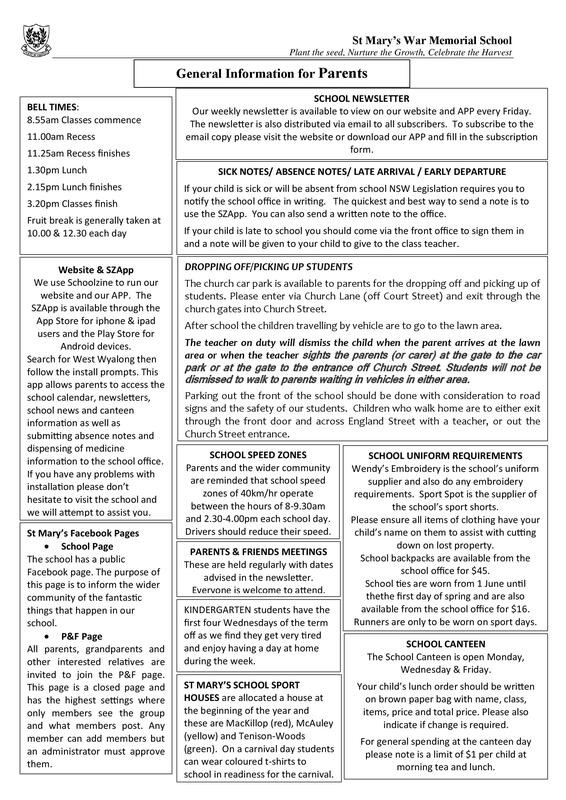 All other students should have this form completed please, it needs to be returned by the first day of school - Wednesday 30 January. Complete the form now and save the worry next year! who celebrate their birthdays during the holidays. 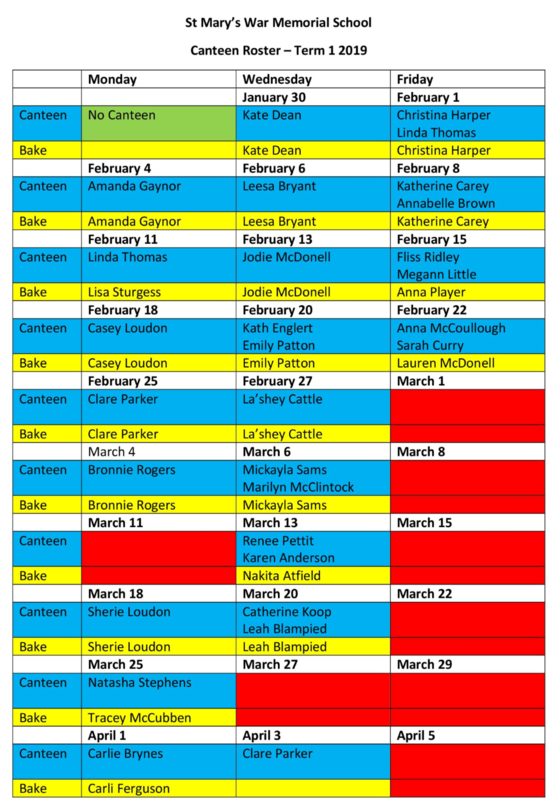 The canteen roster for first term next year is shown below. Please note the days coloured in red indicate there are no volunteers on that day. We are therefore looking for more volunteers for the canteen and baking roster for 2019 so we do not have to ask our volunteers to double each term. 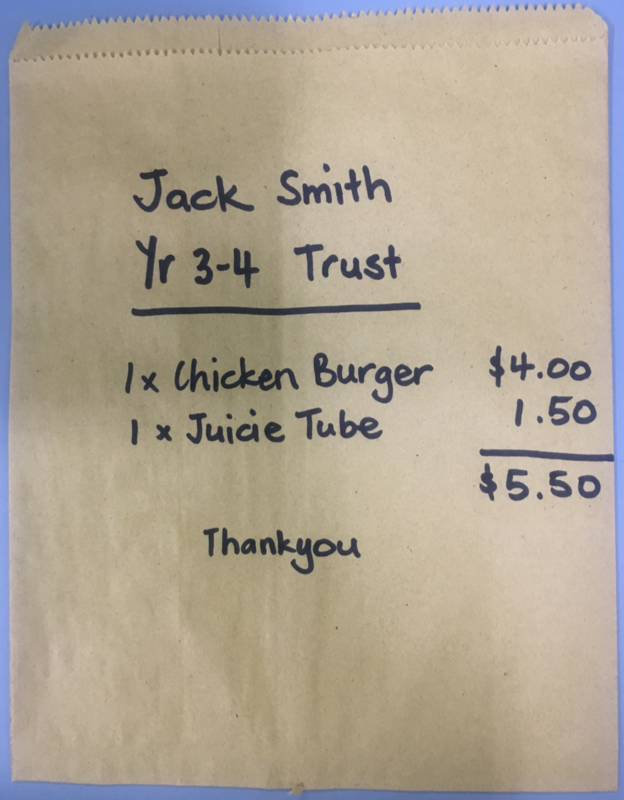 Next year when you send in your child's lunch order please ensure the class name is included as shown below. 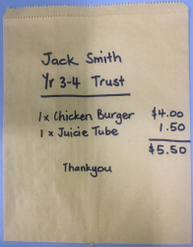 If you have more than one child you can put the money in one bag and just indicate on the other bags which bag the money is in. Below is a list of our sports houses along with their colour. 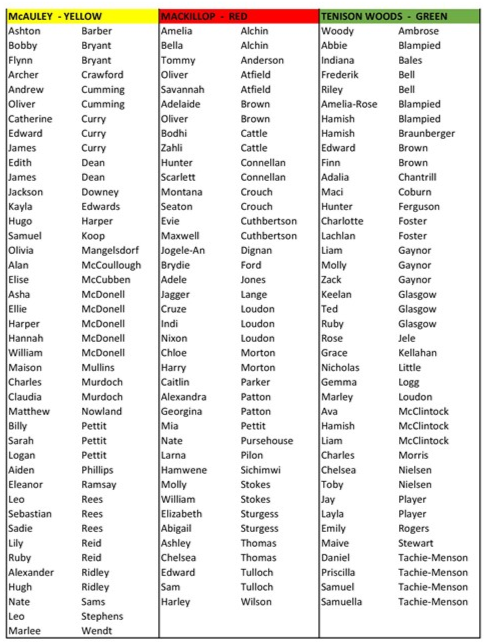 This list will allow new parents to get t-shirts in the appropriate colour before our swimming carnival early in Term 1, 2019. Robyn would like to say thank you for your generous words and gifts as she finishes up as Principal of our school. She is looking forward to coming back to our school next year. We welcome Phil Nielsen, Angela Scott and Emma Jackson as our new leadership team. We also welcome Josie Parker and Jacqui Cuthbertson to our teaching staff. We farewell Stacey Maier as she takes leave to start her family. We say farewell to Father Emil who is leaving us. Four years ago we welcomed Fr Emil to the west and sadly we are saying farewell to him. With his gentle manner Fr has not only guided our spiritual development but has also demonstrated a genuine and caring interest in all of us and what makes up the culture of our school. 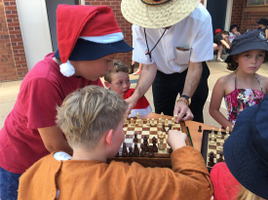 The students appreciate Fr Emil’s presence on the playground and he began his relationship with the children with ice blocks and water pistol cooling off that first February when Fr was feeling the heat a lot more than the kids. In was not long before Fr joined Mr Nielsen in extending the chess club which has been very popular with students of all ages. Class and school masses have also been a highlight these past four years. Fr always has a little story to tell the students that connects with their interests. Fr has been very hands on when preparing the students for the sacraments of first Reconciliation, First Holy Communion and Confirmation. Fr Emil has had pastoral responsibilities that not only include West Wyalong and surrounding villages but extends also to Lake Cargelligo. 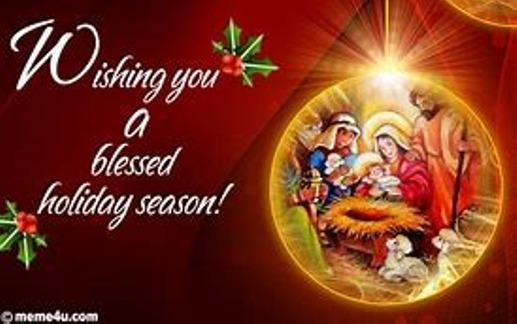 The staff have all very much appreciated Fr Emil’s graciousness and patience and his willingness to accommodate our needs and work with our timetable. We thank you Fr Emil and wish you well in your move to Canberra. May you always be truly yourself.